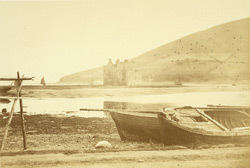 In Chapter XIV of the book 'History of the County of Bute,' John Eaton Reid provides a "genealogical account of the Hamilton family" to accompany Thomas Annan's photograph of Loch Ranza Castle on the Isle of Arran. The castle was sold to the Duchess of Hamilton in 1705, "under charter from Alexander, Earl of Eglinton, upon the resignation of Sir Robert Montgomerie of Skelmorlie, and also upon adjudication from him by the Duchess - sum £43,200 Scots." "Anne, Duchess of Hamilton, eldest daughter of James, first Duke of Hamilton, was born about the year 1636. She married Lord William Douglas, eldest son of William, first Marquis of Douglas...She lived many years afer the death of her husband, residing sometimes at the castle of Strathaven, and sometimes at Arran, and died in 1716, aged eighty, after having spent a long and useful life, so that her memory is still revered in the districts where she lived, in consequence of her many benevolences and charities."